When monstrous creatures, known as Kaiju, started rising from the sea, a war began that would take millions of lives and consume humanity’s resources for years on end. To combat the giant Kaiju, a special type of weapon was devised: massive robots, called Jaegers, which are controlled simultaneously by two pilots whose minds are locked in a neural bridge. But even the Jaegers are proving nearly defenseless in the face of the relentless Kaiju. On the verge of defeat, the forces defending mankind have no choice but to turn to two unlikely heroes – a washed up former pilot and an untested trainee – who are teamed to drive a legendary but seemingly obsolete Jaeger from the past. Together, they stand as mankind’s last hope against the mounting apocalypse. Haven’t you heard Mr. Beckett? So where would you rather die? Here? or in a Jaeger! This was an entertaining relaxing mind-to-zero movie. Best you lie back in your cozy seat to enjoy this one after a stressful week. That means you have to close one eye for the meaningless story and the abominable acting. The whole movie has the “We will prevail” attitude. For a moment I had a real “Top Gun” deja-vu moment when the doomed couple triumphantly returns after a dramatic fight with two Kaiju’s. There’s even a nod of approval from an arch rival. The latter hates the male half of the victorious couple and rather sees him evaporate from this world. Maverick and Iceman probably nodded approvingly at this crucial moment. The superfluous speech by Stacker reminded me of Bush on the rubble of the Twin Towers and sounded so ridiculous patriotic. The whole movie was indeed a tribute to “The Transformers” that had a fun time fighting Godzilla-like aliens. The movements of the Jaegers were in fact already amply addressed in “Real Steel” in the recent past. The predictability was obvious. Especially when my wife already said in the beginning: “Oh, no, I bet that one of the twins won’t make it?” And five minutes later it seemed she was right. It was no surprise that the spectacular ending would follow the mandatory Holywoodian directives : a dying ex-Jaeger sacrifices himself so that the hero and heroine can manage to get their robot through the connection at the last minute and then as a cherry on the cake, the supposedly dead hero pops out of the water. Why was this movie so good you wonder? The bloody slick and beautiful made action scenes. This was pure enjoyment every time. Both in and under water, it looked phenomenal. Most overwhelming were the parts where the battle took place on the mainland. Trucks, containers and supertankers were tossed around like Matchbox cars, compressed as tender buns and used as a destructive weapon against the dinosaur monsters. The CGI looked stunning except that it was sometimes hard to distinguish what happened in close-up moments. 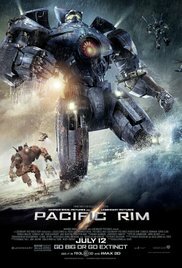 Without the special effects, a movie like Pacific Rim would be difficult to achieve. This was the ultimate prove you can create images with computer images in a convincing and realistic way. It all intrigued me so very much and never lost my attention for a moment. What really surprised me was the fact that there is a evident romantic tension between Raleigh and Mako, but they didn’t fall for the old cliche to let those two lovebirds fall into each others arms. That would have ensured a gagging shiver-moment for me. I also liked the two totally crazy scientists. They were so terribly annoying and played in such an excessive way. But that made me like them even better at the last moment. Especially when they are standing next to each other after the final triumphant victory, with their nervous puffs and a moronic smile. The humor wasn’t present very strongly, but when Hannibal Chau holds his boastful speech about the fact that he knew that the baby Kaiju wouldn’t live much longer, because the lungs weren’t developed completely, and he still ended up being swallowed by it : now that was funny !